According to the ancient tradition of the Church, since Saint Anna, the Ancestor of God, was barren, she and her husband Joachim remained without children until old age. Therefore, sorrowing over their childlessness, they besought God with a promise that, if He were to grant them the fruit of the womb, they would offer their offspring to Him as a gift. 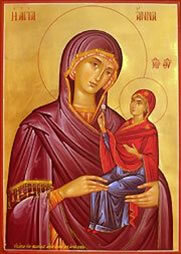 And God, hearkening to their supplication, informed them through an Angel concerning the birth of the Virgin. And thus, through God’s promise, Anna conceived according to the laws of nature, and was deemed worthy to become the mother of the Mother of our Lord. We thank the 433 stewards who have pledged for 2012. Pledge your support by filling out a Stewardship Card, by visiting www.stdemetrios.org to pledge electronically, or by speaking with Kiki at (954) 467-1515.